Lopon Tsechu Rinpoche was born in Bhutan in 1918. When he was 13 years old, he left Bhutan to study and practice under the spiritual guidance of his uncle Lama Sherab Dorje in Nepal. There he received full Buddhist training and meditated under severe conditions in the caves of Milarepa and in the holy places of Guru Rinpoche. In 1944, Rinpoche met H.H. the 16th Gyalwa Karmapa who became one of his most important masters. In the years to follow, Lopon Tsechu Rinpoche became the key figure for Dharma practitioners in Nepal. In 1987, he visited Europe for the first time at the invitation of his first Western students Lama Ole Nydahl and his wife Hannah. Since that time he traveled extensively throughout Europe, the Americas, and Australia giving teachings and countless initiations. He completed the building of a Kalachakra Stupa in Spain and more than 16 other stupas in Europe and Asia. 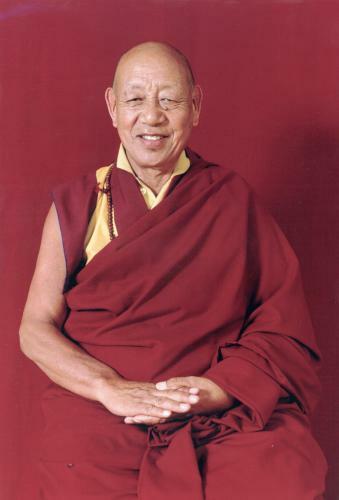 Lopon Tsechu Rinpoche died on June 10th, 2003 in a hospital in Bangkok at the age of 85. The immense power of his compassion was felt by people of every background and continues to benefit all beings.